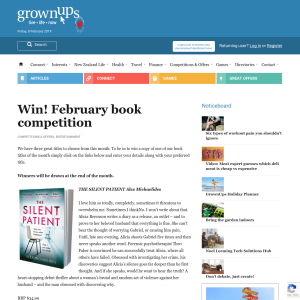 To qualify to enter the Competition, entrants must be a registered member (“Member”) of the grownups.co.nz website (the “Site”) (details on how to register as a member and Site terms and conditions of use can be found on the Site). Employees of GrownUps, its associated companies and agencies and the partners and sponsors associated with the Competition and their immediate families are not eligible to enter. Additional eligibility requirements may apply to a specific Competition, e.g. a valid passport, visas and/or driver’s licence will be required if the Competition is a car or includes travel outside New Zealand and/or car hire. GrownUps reserves the right to disqualify any entrant if it has reasonable grounds to believe the entrant has breached any of these terms and conditions. In the event that any entrant is disqualified from the Competition, GrownUps in its sole discretion may decide whether a replacement should be selected. In this event, any further entrant will be selected on the same criteria as the original entrant and will be subject to these Rules. Only one entry per person per Competition is allowed and multiple entries will result in an entrant being disqualified (unless the competition rules allow for multiple entry). Where a winner has been selected and GrownUps discovers or has reasonable grounds to believe the winner has made more than one entry, GrownUps reserves the right to select an alternative winner. Any further entrant will be selected on the same criteria as the original entrant and will be subject to these Rules. Competition entries must be made in the manner and by the closing date specified on the Competition Notice. Failure to do so will disqualify the entry.